Body lotion of velvet consistency, rich in green coffee extracts, Lipout™, Biopeptide Complex. It activates the thermogenesis processes in the skin, provides slimming and firming effects, smoothens, moisturizes. 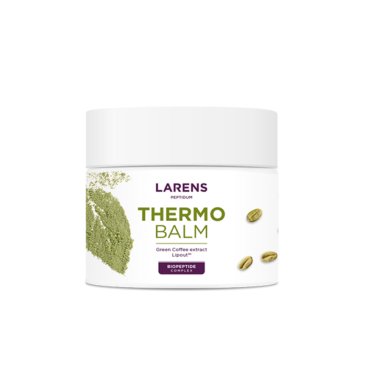 For the fastest and best results, Thermo Balm should be used regularly. We recommend daily application, based on the skin condition: once a day in the evenings, or twice a day – mornings and evenings. 1. When you are in rush: Express treatment Use Thermo Balm as a part of the slimming treatment with Coffee Scrub & Mask. Begin with the exfoliating ritual with Coffee Scrub & Mask. After completing it, rub Thermo Balm into the skin. After rubbing in Coffee Scrub & Mask, leave it on the problematic body parts – thighs, buttocks, belly, arms, wrap it with foil (e.g. food wrap), leave it for 30-45 min, stay warm. After that, rinse the remains of the scrub and energetically rub in Thermo Balm. Velvet-consistency body lotion of irresistible scent of coffee. It activates the thermogenesis process in the subcutaneous adipose tissue, reduces its excess and remodels the silhouette. The slimming effect is accompanied by restoring skin’s tension, firmness, and elasticity, as well as evening its structure. 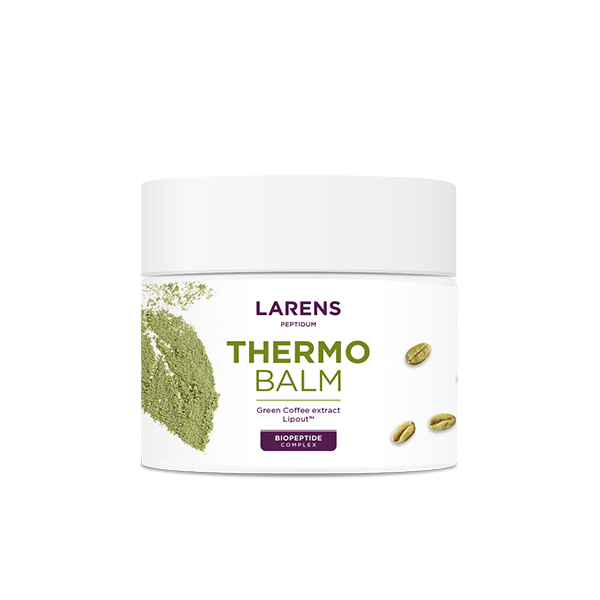 The effects of the Thermo Balm’s use result from the synergy of highly concentrated ingredients known for accelerating the thermogenesis (fat burning) process, as well as stimulating the circulation and reducing cellulite. We owe it to the extracts of green coffee with caffeine and chlorogenic acid, as well as the Lipout™ complex containing Tisochrysis Lutea microalgae. Furthermore, the coffee caffeine contained in the Thermo Balm together with the extracts from Ginkgo biloba (maidenhair tree), Hammamelis virginiana (American witch-hazel) strengthen and improve microcirculation in the capillaries, contributing to removing the excess fat and subcutaneous water from the tissues. Thanks to the multi-tasking fish collagen peptides from the Biopeptide Complex, Thermo Balm moisturizes, regenerates, stimulates the skin to renew the collagen and elastin fibres, while the active ingredients of the product are carried into the deepest skin layers. The regenerating and inflammation-soothing effects are strengthened by the plant extract from the witch-hazel and allantoin. Nourishing, deeply hydrating, and oxygenating squalane acts as a natural sunscreen: prevents damages caused by UV radiation exposure. You can read more about the properties spectrum of each Thermo Balm’s active ingredients in the Active ingredients tab. Biopeptide Complex – a complex patented by WellU containing a valuable combination of oligopeptides and polypeptides, which provide immediate and long-lasting moisturization in all the layers of the skin. The effect of their use in cosmetics is an elastic body, filling in fissures and unevenness as well as prevents sagging skin. Peptides are used to carry active ingredients deep into the skin. They have energizing properties, stimulating skin cells to produce collagen and elastin. They help fight discolouration, brighten and even skin colouring. Lipout™ – a composition containing Tisochrysis Lutea, single-cell microalgae, standardized to the xanthophylls content, containing a significant amount of the polyunsaturated fatty acids. Lipout™ stimulates cellular respiration, while the energy obtained in the process of β-oxidation accelerates thermogenesis and stimulates the process of fat browning – literally burns the fat stored in the adipocytes, hence, regularly used it slims down, reduces cellulite and improves the silhouette. Results can be observed already after 28 days of regular use. The effectiveness of Lipout™ has been proven during in vitro and in vivo tests. Ginkgo biloba leaves extract – flavonoids contained in the ginkgo extract caulk the blood vessels and improve their blood supply. They prevent the creation of so-called spider veins and soothe skin discolourings. They exhibit antioxidating properties – literally wipe out the free radicals, preventing the skin anti-ageing processes. They ward off the collagen degradation in the dermis by increasing the fibroblast synthesis and protecting it against the oxidation of the vitamin C – the most vital collagen synthesis ingredient. American witch-hazel leaves extract – exhibits strong astringent, anti-haemorrhagic, antibacterial properties. Improves skin blood supply, strengthens and narrows the blood vessels. Stimulates the cellular division processes and by doing so stimulates and accelerates healing and regeneration of the irritated skin, soothes the results of sunburns, prevents infections. Soothes inflammations of the vascular, red and irritated skin. Squalane – by providing nourishing substances, deeply moisturizes and oxygenates the skin. It acts as a natural sunscreen: prevents the damages caused by UV radiation exposure, and the creation of the so-called „age spots”. It stimulates the cellular growth, has antibacterial properties, as well as softens and smoothes the skin. Allantoin – facilitates the wounds healing, has anti-inflammatory properties, accelerates skin regeneration. It is mostly used to stimulate granulation – the creation of the new connective tissue. Speeds up wounds healing. Almond oil – moisturizes, improves blood circulation and has anti-ageing properties. Is a natural source of minerals, proteins, magnesium and vitamins from groups A, E, D, B. Thanks to its properties it’s perfect to fight stretch marks. Olive oil – in the ancient times was called liquid gold, contains a large amount of the vitamin E – a natural antioxidant. Protects the skin against the external factors, has anti-inflammatory properties, prevents acne and psoriasis.